The LSFC Class of 1984. Photo scanned from the Stallion yearbook of 1984. That is the way things are in many sporting households, I suppose; albeit my experience was totally the opposite. My Dad and older brother were so into basketball and there was so much of it in the household that, I guess, it was inevitable that I would find myself something else. Still, I know from first-hand experience that older siblings do exert quite a significant influence on what sports the younger ones eventually take up. In this article, I enumerate the brothers who at one time or the other over the years played for my high school football teams. The Silvas. Cesar Jr. (1986) joined up as early as his freshman or sophomore year and stepping up into the senior team was a natural progression because he played for the Little Olympics team. Older brother Fernando ‘Gitoy’ (1984) was a late call-up and did not join until he was a senior. Gitoy went on to play for DLSU-Manila. The Maravillas. Top goalkeeper Ramil (1985) and younger brother Renato (1986) were both training under me at the same time. The younger Maravilla, if I remember correctly, had to change schools in his senior year and, thus, also had to leave the team. 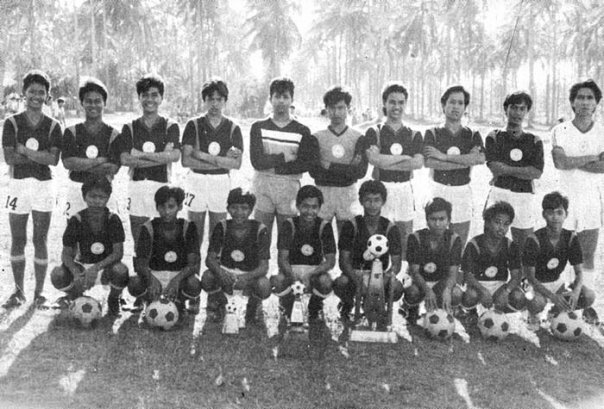 The LSFC Class of 1987, with the Go-for-Goal trophy. The Samaniegos. Roland (1986) did not join up until his junior year although his older brothers were also football players. His older brother Eduard, as a matter of fact, was a freshman in the DLSU-Manila football team when I was graduating. Roland’s younger brother Robert (1989) joined as a freshman when Roland was graduating. Both Roland and Robert played for DLSU-Manila. The Marasigans. First, the Marasigans from Lipa. Eduardo ‘Tuteng’ (1988) joined up towards the end of the school year when he was in Grade 6. He played for the first team for four years and also later for DLSU-Manila and that national team. His older brother Enrico (1985) was more of a casual rather than regular member of the team. There was another pair of Marasigans, but this one was from Lemery. Harvey was a striker for the 1995 team while younger brother Harris played midfield for the 1997 team. The Dagpas. Defender Gerald and midfielder Oliver (both 1985) played in the same team from 1983-85. Younger brother Emerson was the regular holding midfielder in 1988 and 1989. Another brother, Jonathan (1984) was also a casual player. The Lumawags. Jonas was midfielder and captain of the 1985 team. Younger brother Joey played for the 1987 team. The Acordas. Noel was goalkeeper for the 1986 team. Younger brother Paul was the regular right wing-half for the 1989 team. The LSFC Class of 1991. The Acostas. There were two pairs of Acostas who played for me. 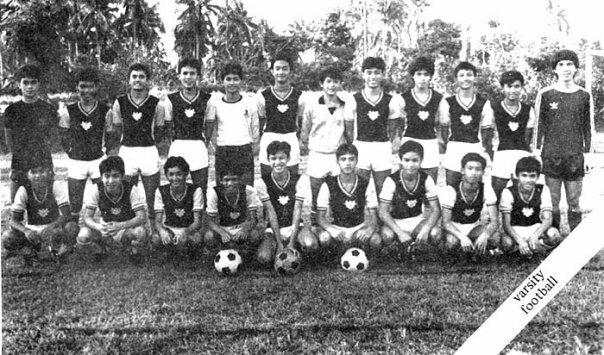 In the first pair, Victorino Jr. ‘Vic’ was striker for the 1986 team and played in the same team with younger brother Victorino III ‘Torino’ (1987) until the latter had to change schools. For the second pair, Central defender Jerry (1989) was really the football player; but his older brother Jeffrey (1988) was somebody we borrowed from the volleyball team to keep goal for us in the Coca-Cola Go-for-Goal tournament. Jerry went on to play for the San Beda Red Lions. The Carbonillas. Rightback Erik (1989) and midfielder Joel (1990) played together in the 1989 team. Ariel (1991), who was killed in a vehicular accident on his senior year, was a transferee to the school on his junior year and joined up at the start of the schoolyear. Joel went on to play varsity football for the Mapua Cardinals. The Ferrers. George Vincent was a utility player for the 1989 team. Jomel was on the left wing for the 1991 team. George Byron was defender and captain of the 1992 team. The Ilagans. Joseph played both defender and winger for the 1989 team, while younger brother Don – now deceased – played for the 1991 team. I’m not a hundred per cent sure but I seem to recall that Don played for the FEU Tamaraws. The Valdezes. Arthur – now deceased – was the goalkeeper of the 1987 team. Younger brother Bryant was defender for the 1993 team. The LSFC Class of 2001. The Cuencas. Neil ‘Kalabito’ was the regular leftback for the 1989 team while younger brother Janis played for the 1991 team. The Vergaras. 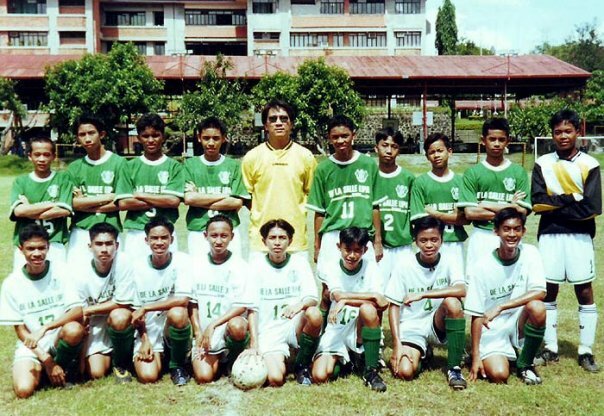 Jericho ‘Jikoy’ was striker for the 1993 team was Jeffrey, who was much younger, was a left-sided defender for the 2001 team. The del Rosarios. Monte played defender and striker for the 1993 team while younger brother Tyrone was a defender for the 1994 team. The Mercados. Erdel was a striker for the 1994 team while younger brother Eduard would have been a midfielder for the 1996 team had he not left on his senior year. The Dimaculangans. There were two branches of the Dimaculangan family that played for me. Runilo ‘Ronie’ (1993) was the pioneer from the first branch. He later played for UP-Los Baños. Younger brothers Angelo and Ian, I think, both played briefly. Their cousin John (1996) was the first from the other branch; and we had to pry him from the basketball varsity. Joseff ‘Totet’ (1997) played as a freshman, disappeared from sight and returned on his senior year to become a regular member. James (2002) joined up from the volleyball team and later played for the San Beda Red Lions and the youth national team. Jonas (2004) was a promising player but had to change schools. The Osabels. Federico III ‘Ozzy’ (1996) and younger brother Federico IV ‘Choco’ 1997 were both defenders and played in the same team for a year. Both went on to play for the San Beda Red Lions. The LSFC Class of 2006 after winning the NCAA-South High School championship. The Paduas. Both Mark Lester (1996) and Mark Allen (1999) were central midfielders although either could also be pushed upfront to play striker. The third brother, Mark Vincent, never made it to La Salle because the family returned to live in Vienna. The Puertollanos. Ryan Paul was midfielder or striker for the 1996 team and played for the San Beda Red Lions while Keats Izle was midfielder for the 2001 team. The Jiaos. Jerome (1996) played for a couple of years but left on his senior year and joined the track team instead. Younger brother Jeremias (2001) was a left-sided player who would play for the San Beda Red Lions and the national team. The Aspas. Richard Aspa played for the 1996 team while his older brother Anthony (1995) also played but did not finish till his senior year with the team. The Corros. Corro brothers Carlo and Andres were Ilonggos who grew up in Venezuela but returned to live briefly in Lipa where their father managed a farm. While in Lipa, both played for my football team. The Valencias. The two ‘Dubais’ of the football team. Reymund was defender for the 1996 team while younger brother Rommel was defender or midfielder for the 2003 team. Rommel went on to play for DLSL College. The Alamillos. Romeo Pinkerton ‘Pinkoy’ was captain of the 2003 team while younger brother Paolo Pinkerton played midfield for and was captain of the 2005 team. Pinkoy played briefly for the DLSL college team. The Carandangs. Michael was striker for the 2001 team while younger brother Mark Arvin was striker or midfielder for the 2003 team. He also played for the San Beda Red Lions. The Lirios. Arvin was goalkeeper for the 2002 team while younger brother Carlo was a utility player for the 2006 team. The Pagayonans. John Albert joined as a freshman and stayed with the team till he graduated in 2003. Younger brother Alvin (2004) also played but did not stay till his senior year. The Maralits. Jed Victor was captain of the 2006 team and played briefly for the DLSL college team. Joshua was a midfielder and captain of the 2009 team and also played for the school’s college team. The Simeons. Triston was striker for the 1995 team while younger brother Roy was the regular goalkeeper for the 1998 team. The Medinas. Kim (2006) was the first of three brothers to join up; but younger brothers Paolo (2008) and Joseph Victor (2011) joined as graders and so, thus, played many levels of varsity football. The Gherardellis. Leo was a top defender for the 1999 team although he graduated one year later. Younger brother Lorenzo was striker for the 2011 team. Both now live in Europe. The Yusons. Romualdo ‘Aldo’ was striker for the 2007 team. Two brothers also tried the game but did not continue. Gerard tried his luck briefly for the senior team while Francis trained with the elementary team but played basketball in high school. The Atijons. Why-oh-why did I forget this at the first writing? Gregg was the regular goalkeeper of the 2006 team and played for the DLSL college team as well. Younger brother Gem was a member of the 2008 team and played some college football as well.